Can a kid participate in soccer if their family doesn’t own a car? Tim and Maddie had a conversation about that very subject on Twitter today…she was surprised to learn that our kids play soccer and we don’t have a car. (She knew about the car part, she just didn’t know about soccer). The answer is Yes, it can be done. You don’t need no stinking mini-van to be a soccer mom. In fact, you can even be a soccer *coach* and not own a car. (Thank you, Xtracycle). For the past 3 years, I have coached the boy’s team. I’m proud to report that I can haul all the team equipment on the Xtracycle (I can even do it on the tandem in a pinch. And once, I crammed most of it in the Brompton bag). 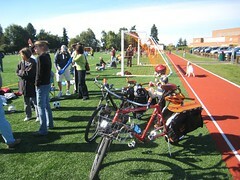 In Seattle, bikes and soccer are a breeze the first 3 years when the teams are in House League (more on this later). It gets more complicated as they get older and start playing teams from other parts of the city. But it’s still doable. Kids have an infinite supply of energy, remember? Seattle Youth Soccer is divided into Clubs based on geographic boundary. 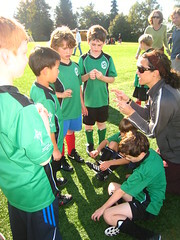 Our kids play for LVR (Laurelhurst, View Ridge, Ravenna). For the first 3 years, the kids play “House League” and they only play other teams from their club. All of the games are at the same field – ours were at Eckstein Middle School (a short .8 mile ride from our house). You’d think it was farther judging from the stream of cars in and out of that parking lot every week. Since this is a neighborhood league, I’d say the majority of families live at most 2.5 miles from Eckstein…and most people drive there. Avoiding the Eckstein parking lot and all of the traffic is motivation enough for me to ride instead of drive. Field side bike parking is an added bonus. When the teams move up to City League, they play teams from other parts of the city. While you could potentially play teams from far away clubs, we’ve been lucky and most our daughter’s games have been against clubs that are close. With the exception of 1 game, all have been within a 3-5 mile bike ride from our house. Our home field is Magnuson (3.5 miles away) and the farthest game on the schedule is in Magnolia (7.9 miles away). And while I groan when I see the far away games on the schedule, it’s really not that bad. Our daughter rode 25 miles a day on our bike tour this summer, she can certainly ride 7.9 miles to Magnolia to play soccer. If she complains too much, Brompton on Metro is always an option. What? You make your kids take the bus? What kind of mom are you? Practices are at local fields. Since I coach our son’s team, I get to choose the field location. I purposefully chose a field that is bikable or walkable for most families. And I’m happy to report, we did have walkers and bikers this year! Our daughter’s practices are at Magnuson Park (3.5 miles from our house). Except for some rides with friends to practice, most of the transportation has been done on bikes. Since I had a conflicting practice time with my team on one of her practice days, she (and a Brompton) got a ride with a friend to practice. Tim rode down to Magnuson after practice and biked home with her. 3.5 miles is a completely doable ride for any kid who is able to run around a soccer field for an hour an a half. Just call the ride to and from practice their warm up and cool down. We often wonder why more parents don’t bike (or walk) to soccer. But then again, we wonder why more people don’t walk and bike in general. Any other parents out there who bike to soccer? This entry was posted in alternative transportation, bikes, kids and tagged bikes, kids, seattle, soccer, soccer mom. Bookmark the permalink. Our one and only soccer field is located 8.4miles away, on a two lane 55mph road! However, a lot of the downtown families choose to practice at a local park, that is very walk/bikeable 😉 The fields can be reached by bus, but our busing needs some improvement, and it’s $1 each way/per person (we are a family of six), making it “less expensive” to drive (if you can). We are in the weaning stages of going car-free and have looked at soccer as a potential challenge, but think it’s one we would over come with some multi-modal creativity. Glad Family Ride gave you the nudge! This was a great post, especially seeing the bikes on the field. Just checked out your blog. Seems like you are enjoying biking! I can’t even imagine doing it with 4 kids…that’s intense! Yes indeed! We are car-free in Tallahassee, FL – not the bike friendliest place unfortunately. Soccer is 5 miles away – for games our daughter usually pedals her own bike there as our younger kids tag along on the xtracycle. Occasionally she gets a ride on the back of the xtracycle if the other kids stay home. Ironically, the worst part of the ride is the stretch on the park road (a big park with lots of fields)…busy with drivers late for soccer games I guess. I know what you mean. I think the most dangerous stretch for us is entering and maneuvering in the parking lot! Car-free soccer in Eugene, Oregon. We have 4 kids and our kids ride their own bikes to practice and the games all over town. Eugene is a very friendly place for bicycling. Thankfully we live in the middle of town and our soccer trips take us in all directions. Our kids are young (6, 6, 8 and 10) and that makes for busy weekends for sure. Our six-year-old goes with his after-school program to soccer practice in a van with his team, but my husband picks him up afterward on the Kona MinUte on the way home from work. It’s been great; he just bikes right onto the soccer field as other parents are circling for parking and visibly seething or panicking. At the start of the season I was one of those parents, which lasted exactly one week. We are new to bike commuting with kids and San Francisco has some intense hills, so we haven’t yet biked to a game, but it’s coming: Saturday parking at the Marina is nearly unbearable, and after commuting on the bike our son hates the car. We were in San Francisco last Thanksgiving and got a chance to ride around the city. It was super fun once we figured out the areas to avoid (like the Financial District during rush hour!) Intense hills for sure. One of my favorite thing about riding bikes is avoiding parking. I really don’t have the patience to circle for parking anymore. Today was the first soccer game trip on the bike and it was a huge success, saving probably 20 minutes in parking, plus our son was thrilled. The hills remain grim but there’s no going back. A colleague told me she blew a head gasket on her car carpooling her kids to soccer. 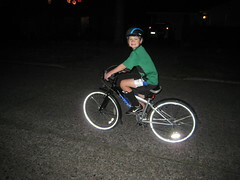 We often bike to games, but biking home uphill after practice at 7:30 on a school night in the dark is not very fun. We also did not bike to our two most recent away games (23 miles and 12 miles). 23 miles is far. So is 12. I would drive too! I’m not a soccer mom… don’t have kids and if I did they would call me dad. Anyways I’m a elementary teacher (3rd grade) here in San Antonio, Texas. Our parent pick up is 99.9% cars the 0.1% is one dad who rides his bicycle (Smart parent). I do cross walk duty and I even know parents that only live 1/2 block away that drives their kid to school and wait in the traffic line after school to pick them up. These are people that don’t have physical limitations that would prevent them to ride… no wonder San Antonio is one of the most obese cities in America! We can’t even walk a 1/2 block! Luckily the city has been doing a good job at promoting health in the city encouraging people to get active.. the only problem is they focus on sports and cycling for sport…not utility! Our daughter is a crossing guard…I bow down to you (especially in San Antonio). Driving a 1/2 a block is the silliest thing I’ve ever heard. Huntington, WV got the honors of most unhealthiest city in America for these very reasons. We are the only biking family at our current school and I know there a couple walkers. Our former school was a block and a half away so we walked every day b/c the carpool line was way too long even for a torrential rainy day, when staying dry and warm with an infant seemed like a good idea. I went to a PTO meeting to ask for a bike rack, b/c on the days we did bike I would have to walk the child’s bike home to keep it safe, and the principal told me it was “illegal to bike to school” Oh the attitude of people here! Thank you! I’m now prepared to become a soccer mom next year 🙂 Here’s hoping all our practices and games are at Wallingford Playfield. The carpool + Brompton sounds brilliant, by the way. I had thought of folders as only fun, but not necessary before. So much to think about! Have a good time! I enjoy Greenlake games…that’s a really easy ride for us and way faster to bike than to drive. The Bromptons are so very useful. I highly recommend them – especially when kids can start riding them. Thanks for this post. It, and other gems on your blog (and especially talking to you in person) really help me visualize how family biking can continue for us as our kids grow. Anne, as you know we’ve been trying to ramp up the bike-to-soccer vibe on Emmie’s team the last several weeks as well. This Sunday we set our new record — 4 kids, 1 coach, and 7 fans (parents) arrived on bike! Let’s face it, the game was at Green Lake and it was a crazy sunny Seattle day, so it could have been even better, but I feel like it’s a step in the right direction. We’ve had a couple of consistent families for the closer games all year, and as many as 11 of the team and parents the last couple weeks, so at least we’re consistent. The next game is at Eckstein so no excuses will be allowed!! Anyway, some photos at http://www.flickr.com/photos/53073701@N05/sets/72157627949799923/. Hey Clint….11 bikes is definitely a movement! Right on. Love the photos. Thanks for the ever-wonderful example.